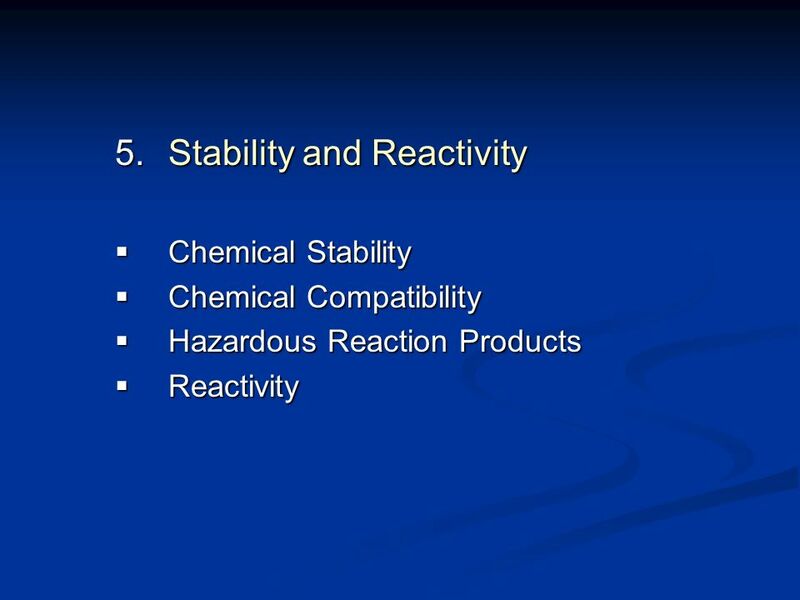 It requires for each chemical. 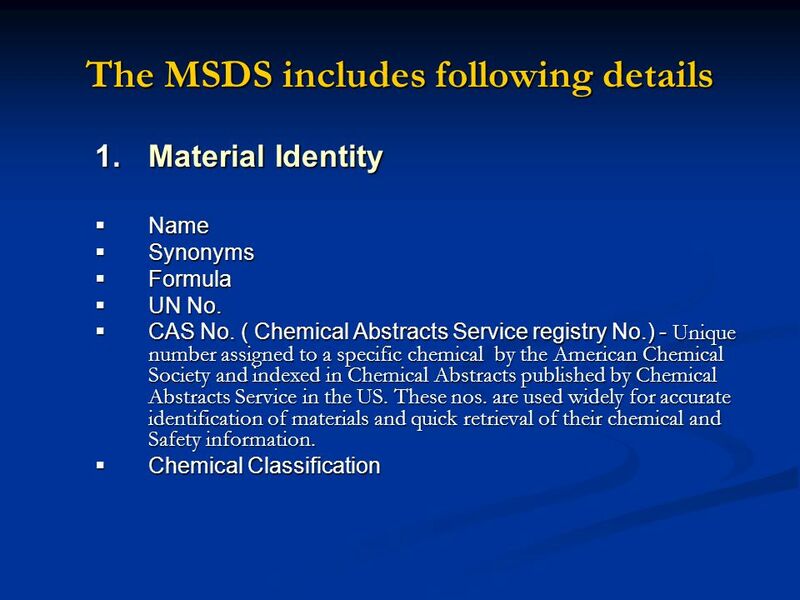 It requires to operators, officers and chemist review. 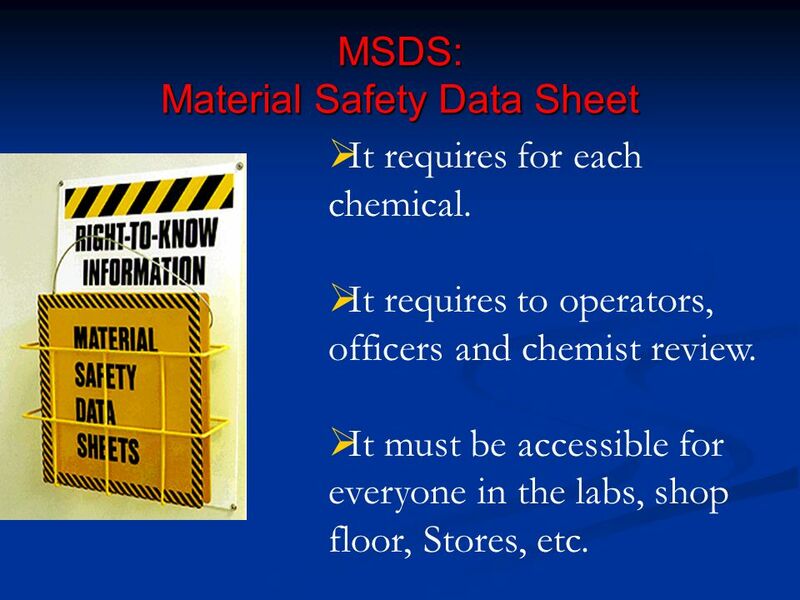 It must be accessible for everyone in the labs, shop floor, Stores, etc. 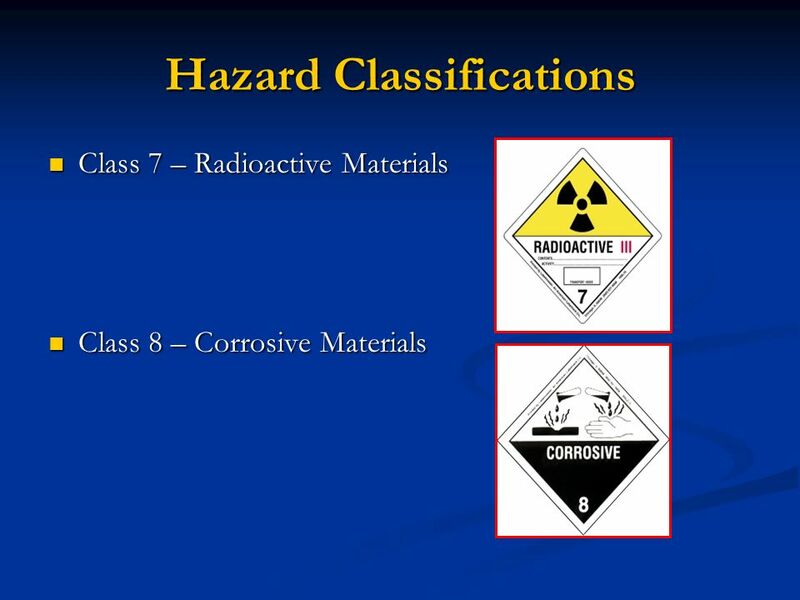 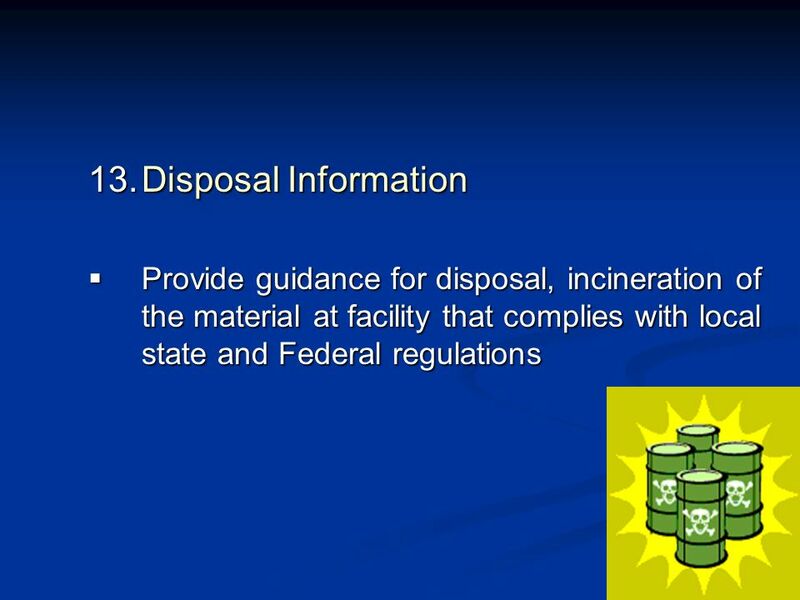 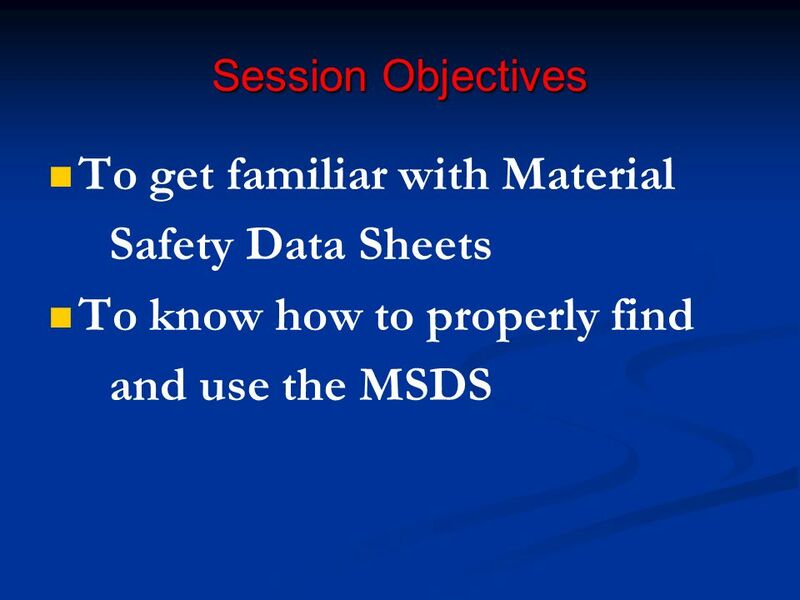 4 MSDS Location MSDS are required to be easily accessible by you at all times. 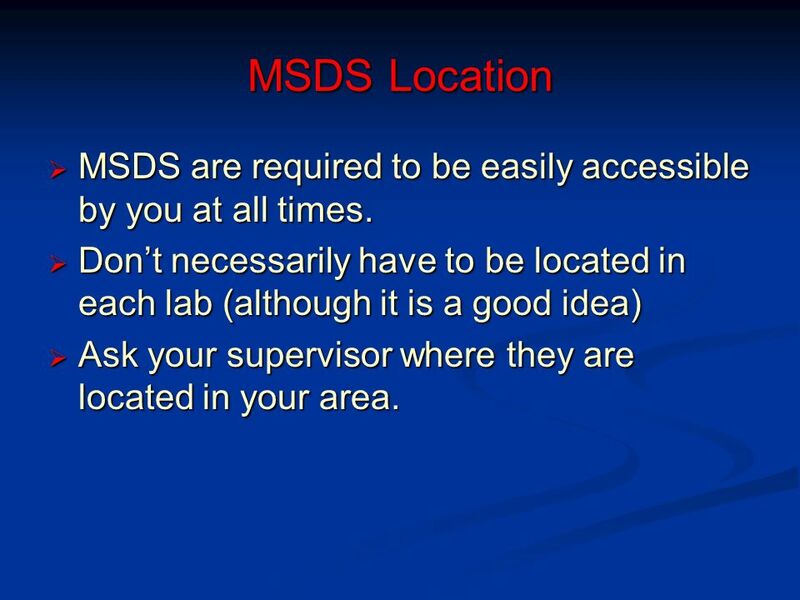 Don’t necessarily have to be located in each lab (although it is a good idea) Ask your supervisor where they are located in your area. 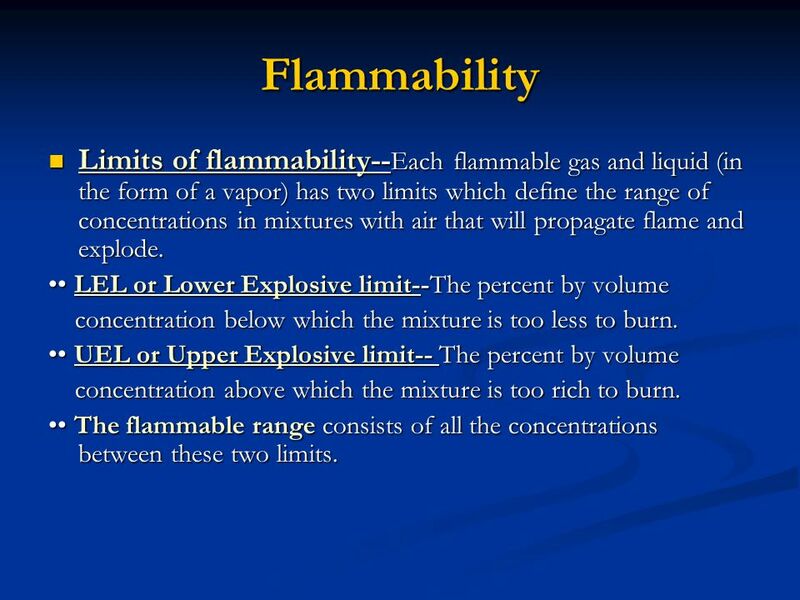 11 Flammability Limits of flammability--Each flammable gas and liquid (in the form of a vapor) has two limits which define the range of concentrations in mixtures with air that will propagate flame and explode. 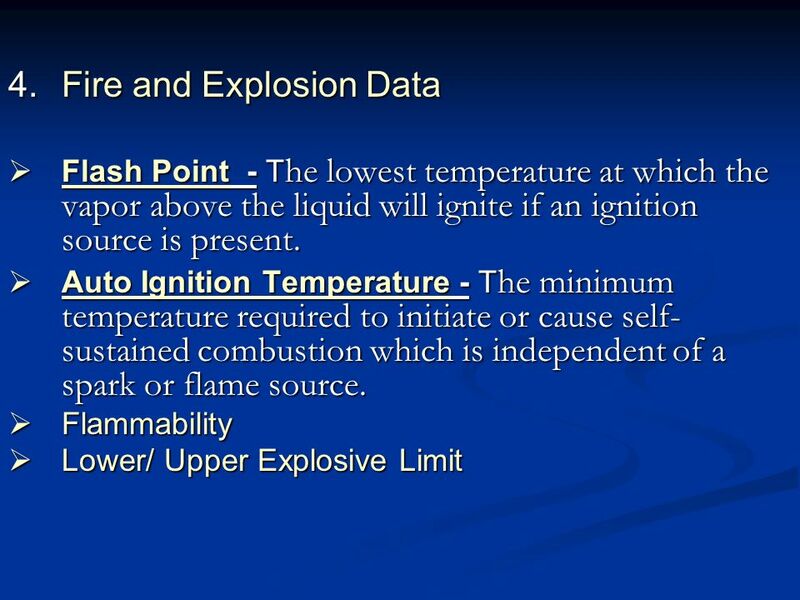 •• LEL or Lower Explosive limit--The percent by volume concentration below which the mixture is too less to burn. 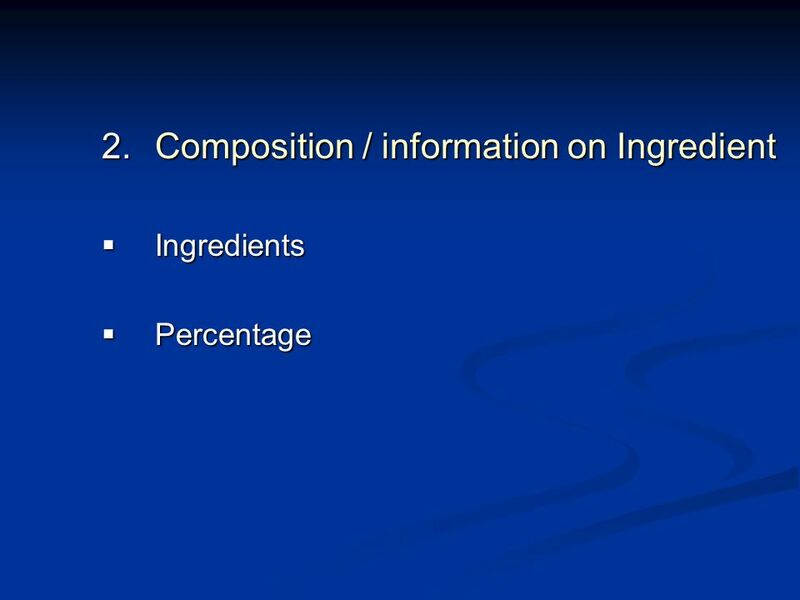 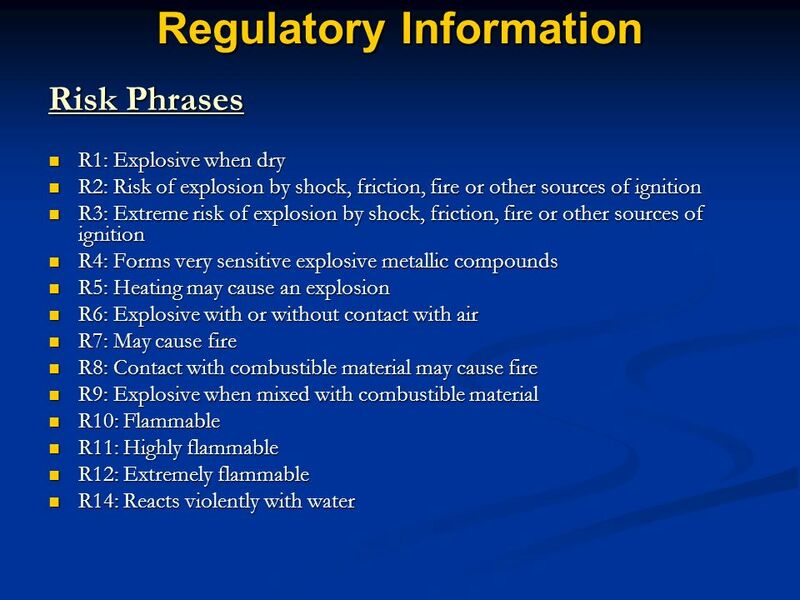 •• UEL or Upper Explosive limit-- The percent by volume concentration above which the mixture is too rich to burn. 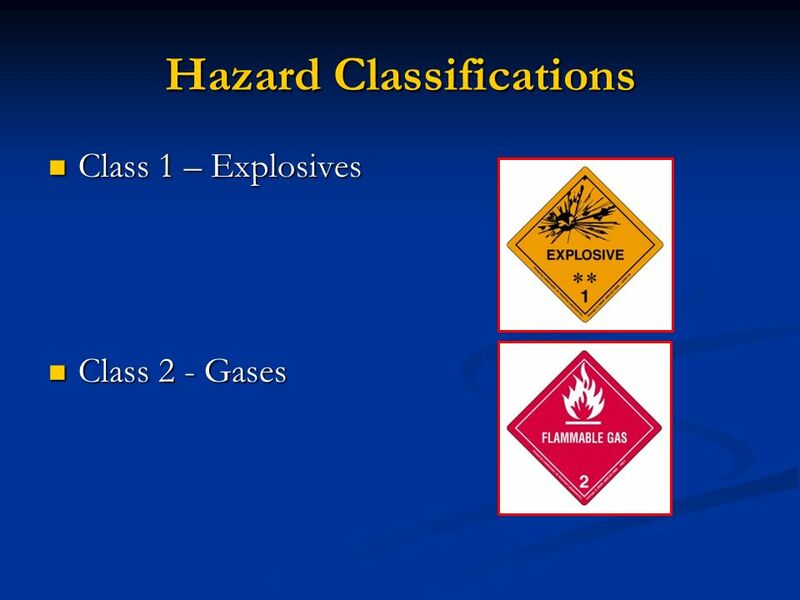 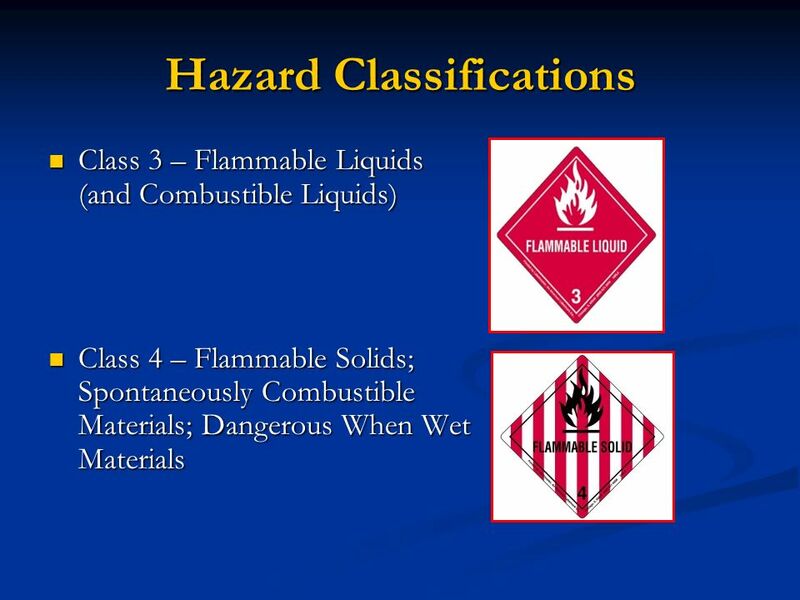 •• The flammable range consists of all the concentrations between these two limits. 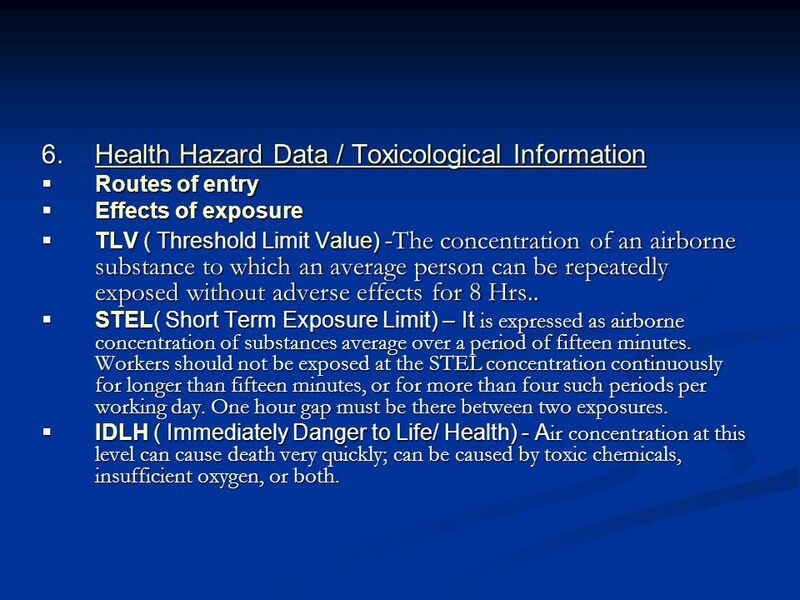 Routes of entry Effects of exposure TLV ( Threshold Limit Value) -The concentration of an airborne substance to which an average person can be repeatedly exposed without adverse effects for 8 Hrs.. STEL( Short Term Exposure Limit) – It is expressed as airborne concentration of substances average over a period of fifteen minutes. 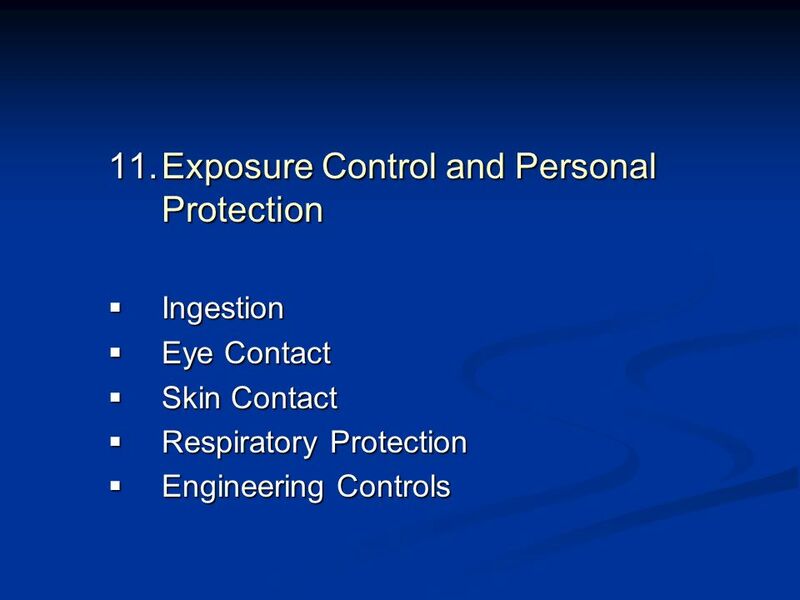 Workers should not be exposed at the STEL concentration continuously for longer than fifteen minutes, or for more than four such periods per working day. 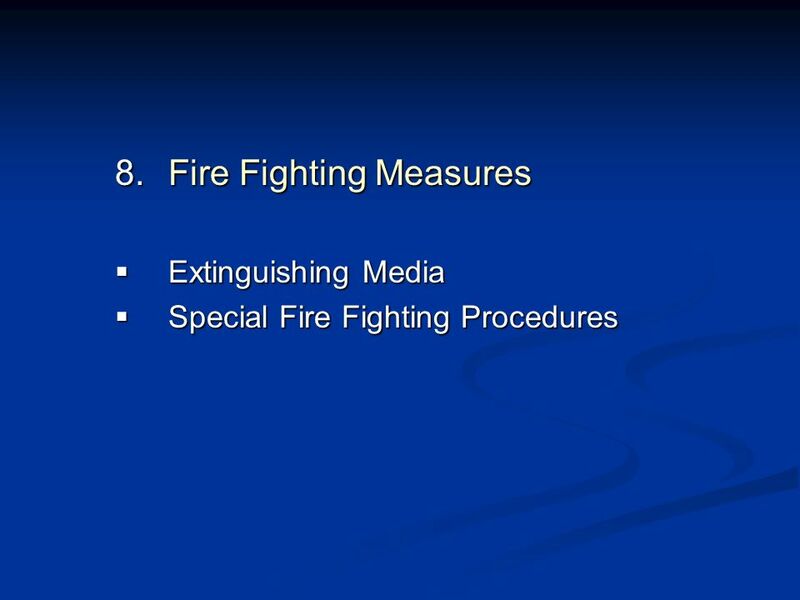 One hour gap must be there between two exposures. 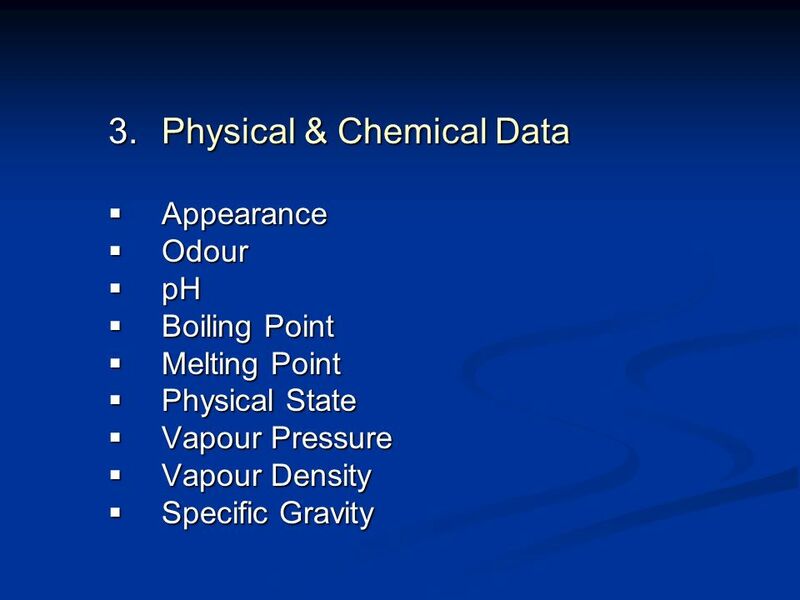 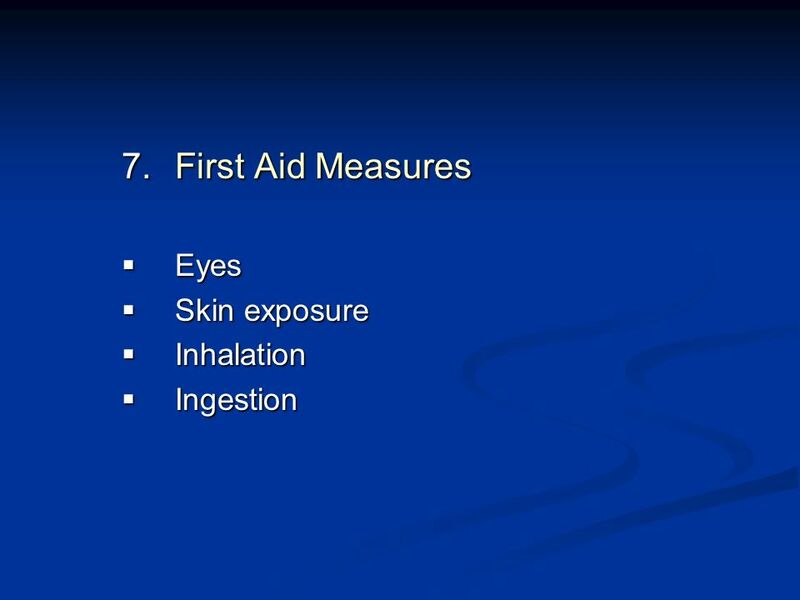 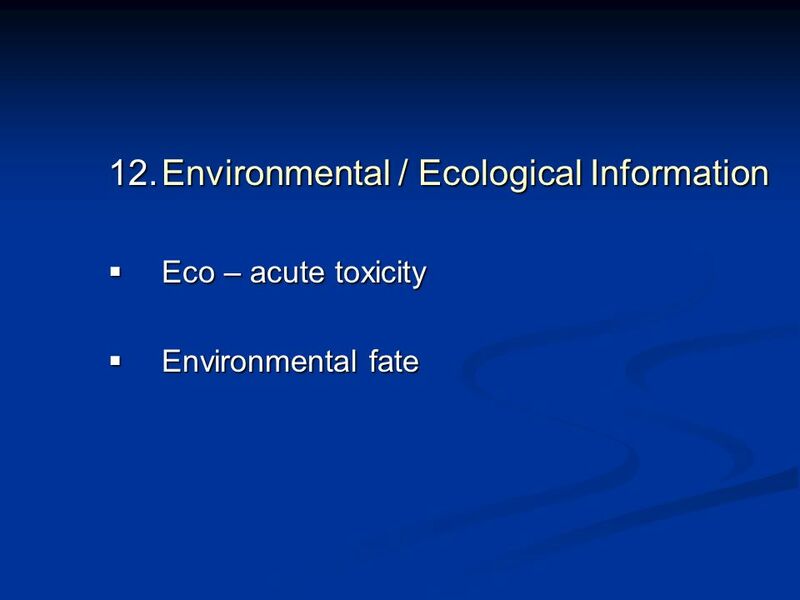 IDLH ( Immediately Danger to Life/ Health) - Air concentration at this level can cause death very quickly; can be caused by toxic chemicals, insufficient oxygen, or both. 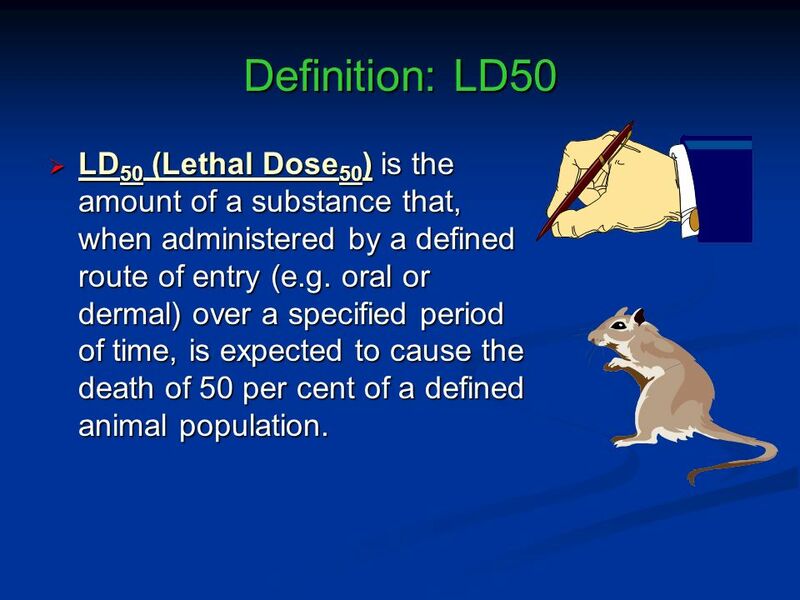 14 Definition: LD50 LD50 (Lethal Dose50) is the amount of a substance that, when administered by a defined route of entry (e.g. 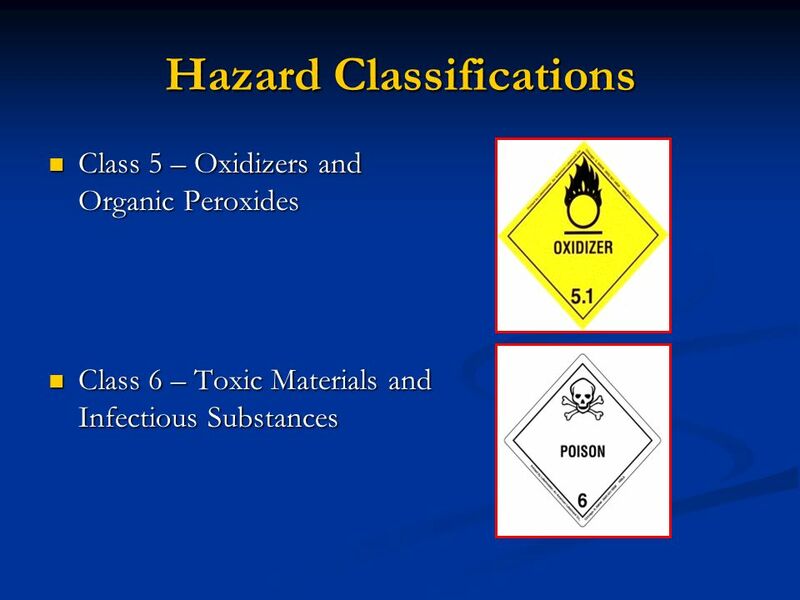 oral or dermal) over a specified period of time, is expected to cause the death of 50 per cent of a defined animal population. 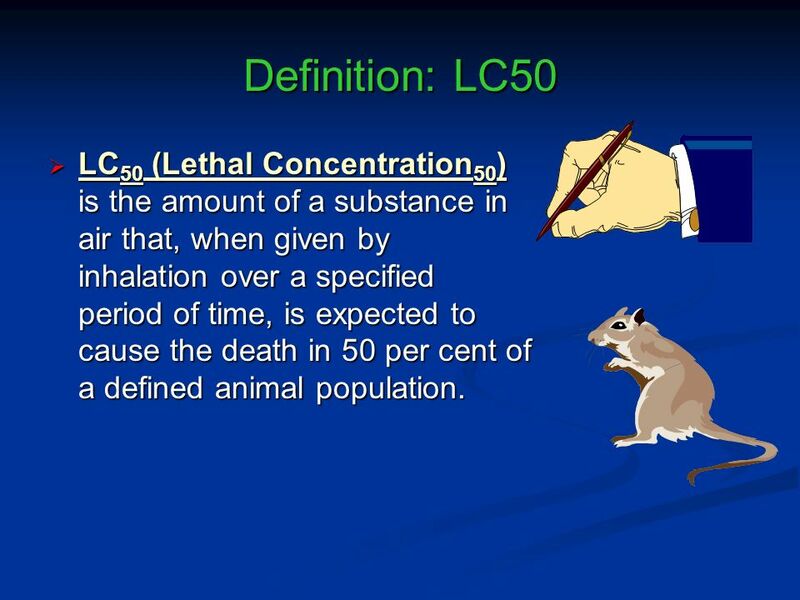 15 Definition: LC50 LC50 (Lethal Concentration50) is the amount of a substance in air that, when given by inhalation over a specified period of time, is expected to cause the death in 50 per cent of a defined animal population. 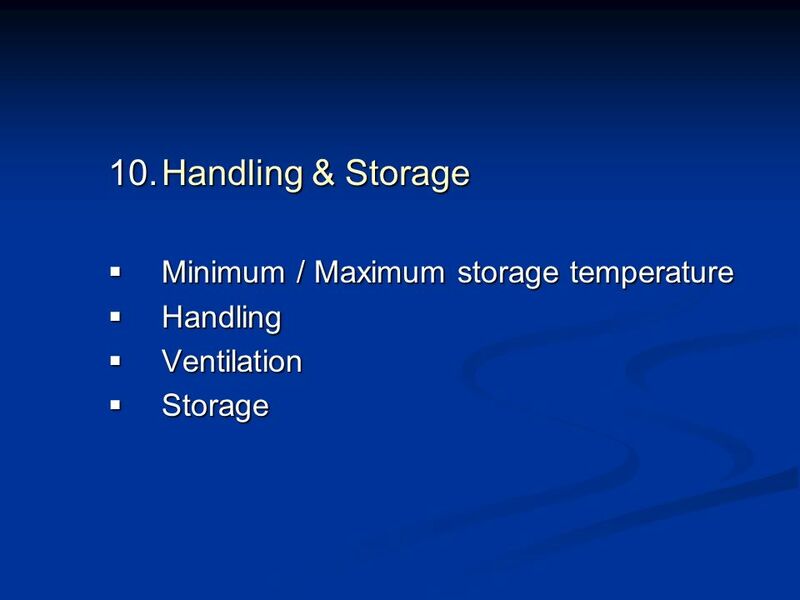 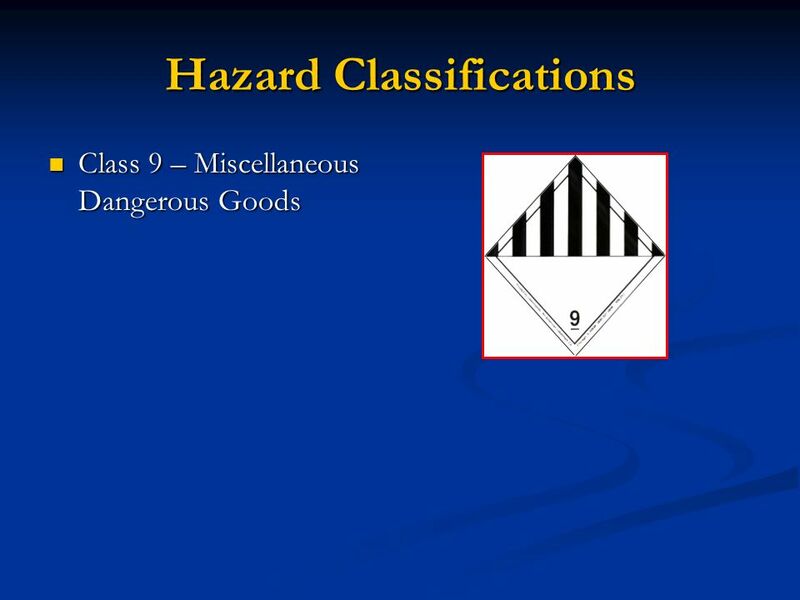 19 When a Spill Strikes ) Assess the risk Minor Spill, handled by personnel within lab or department. 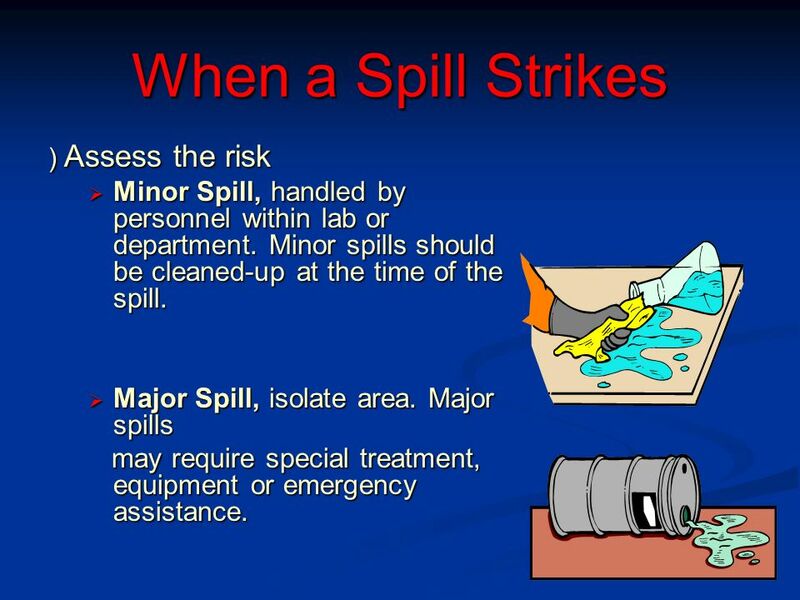 Minor spills should be cleaned-up at the time of the spill. 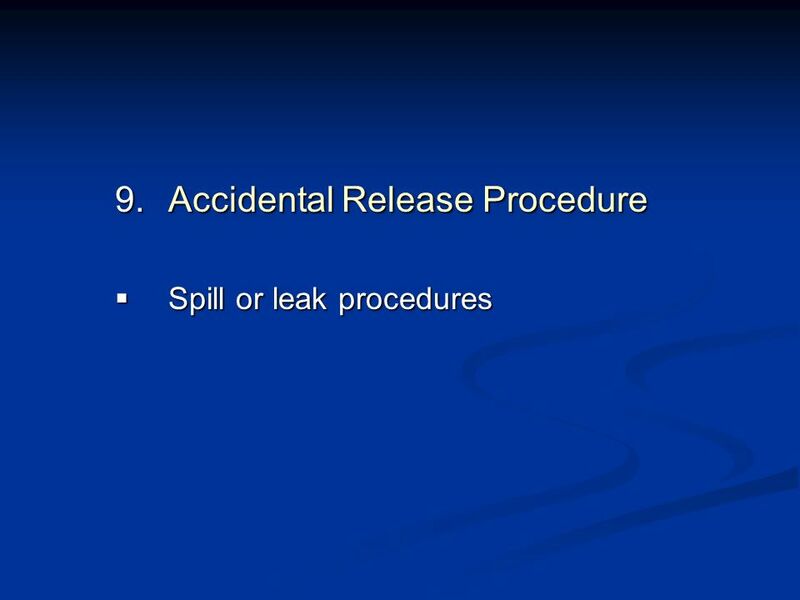 Major Spill, isolate area. 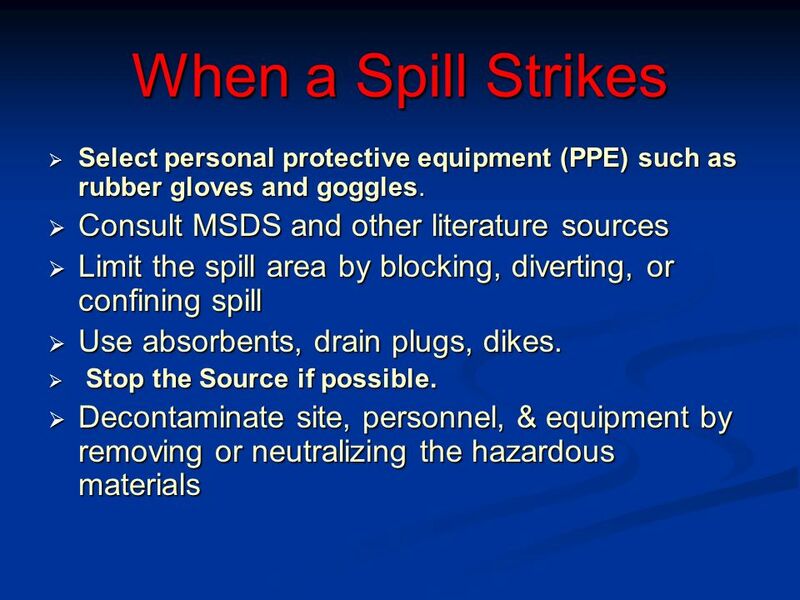 Major spills may require special treatment, equipment or emergency assistance. 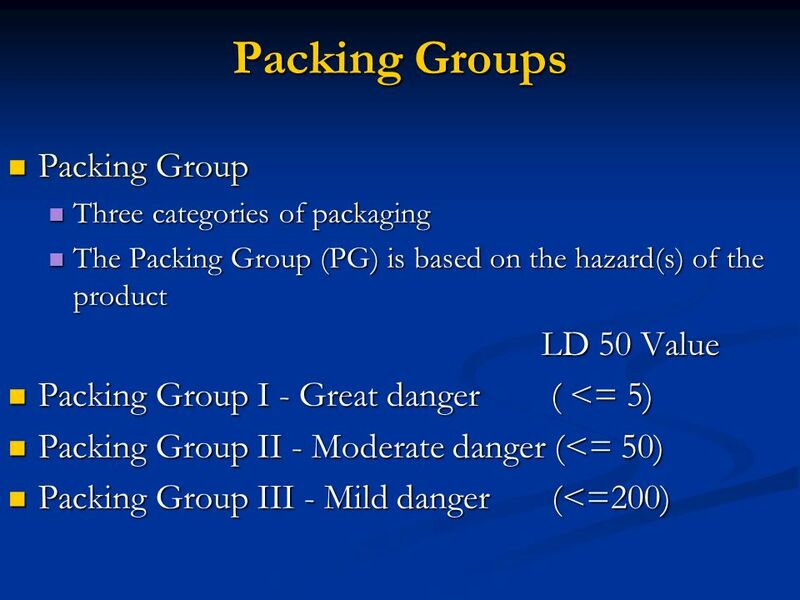 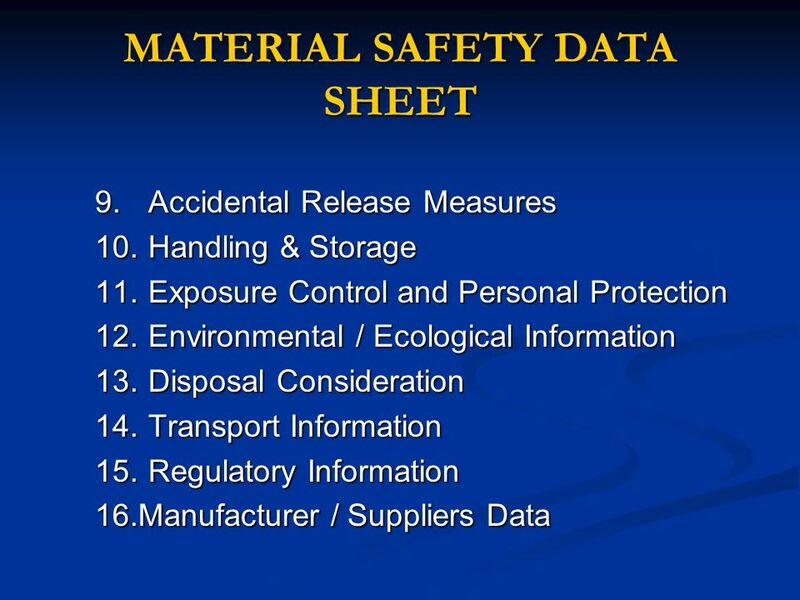 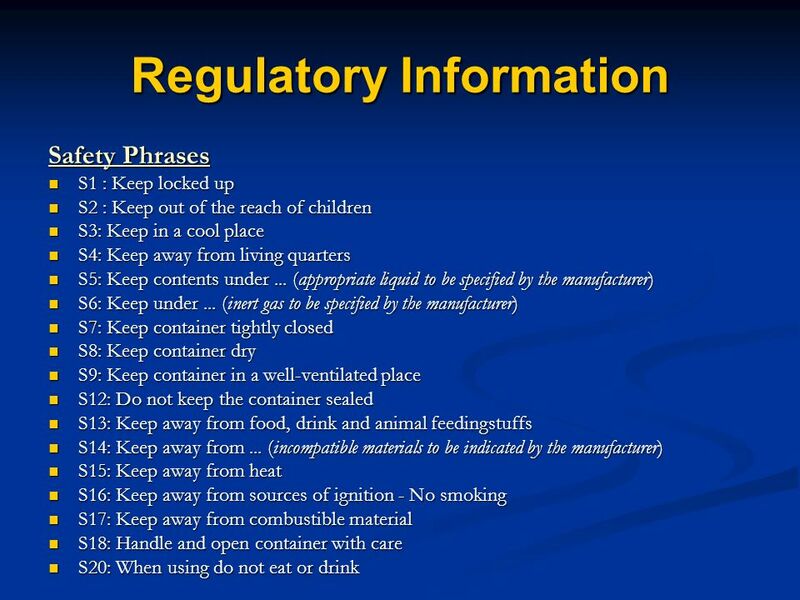 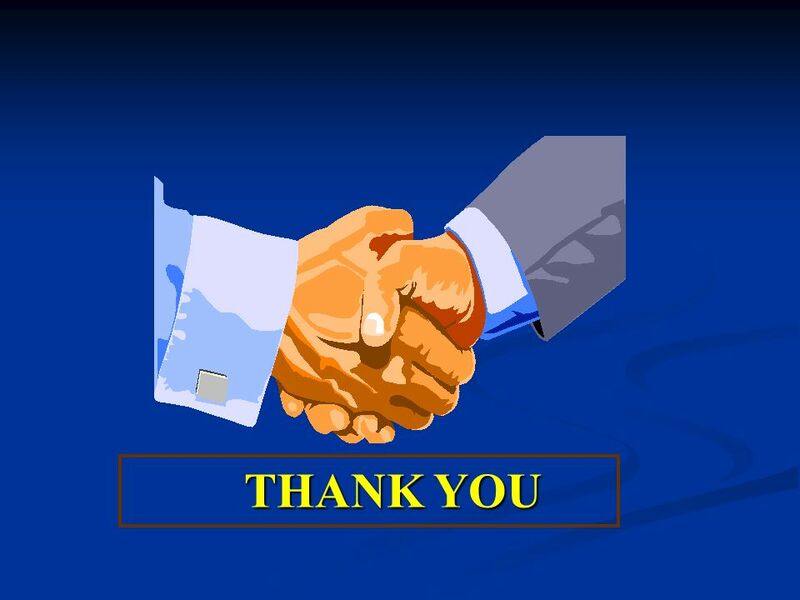 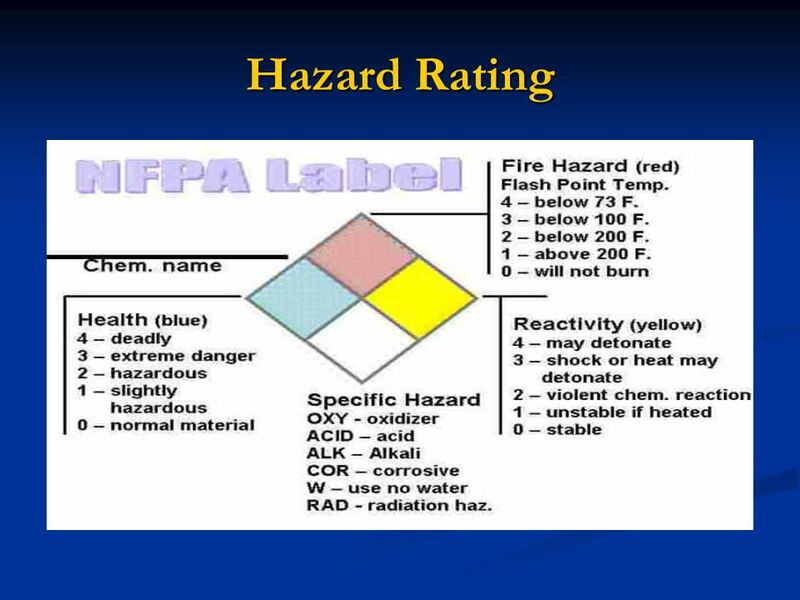 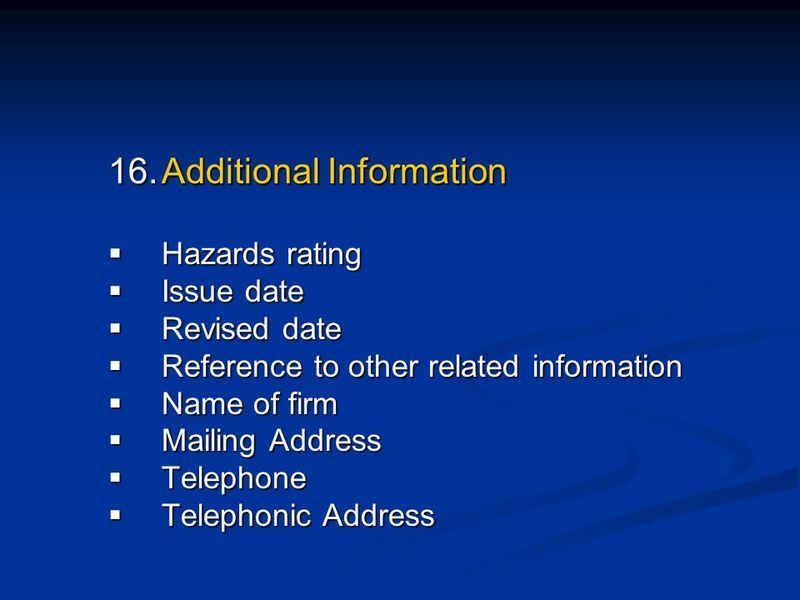 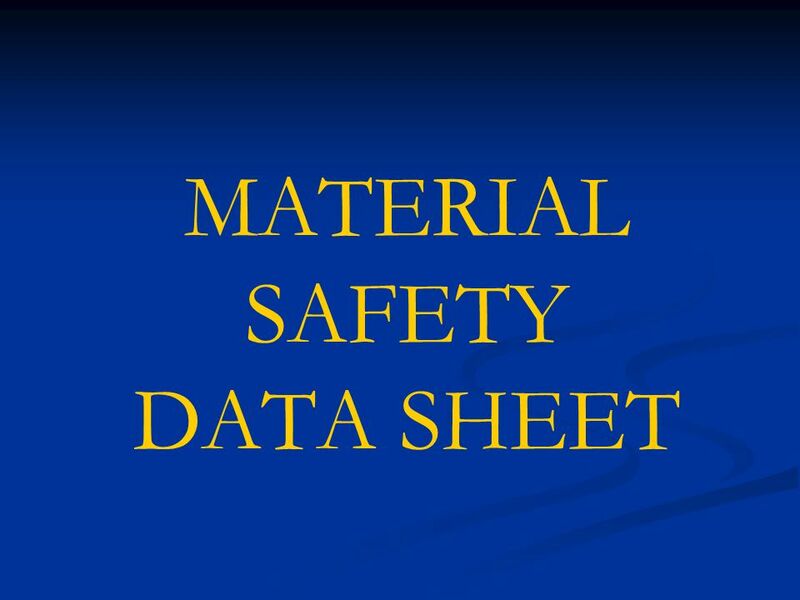 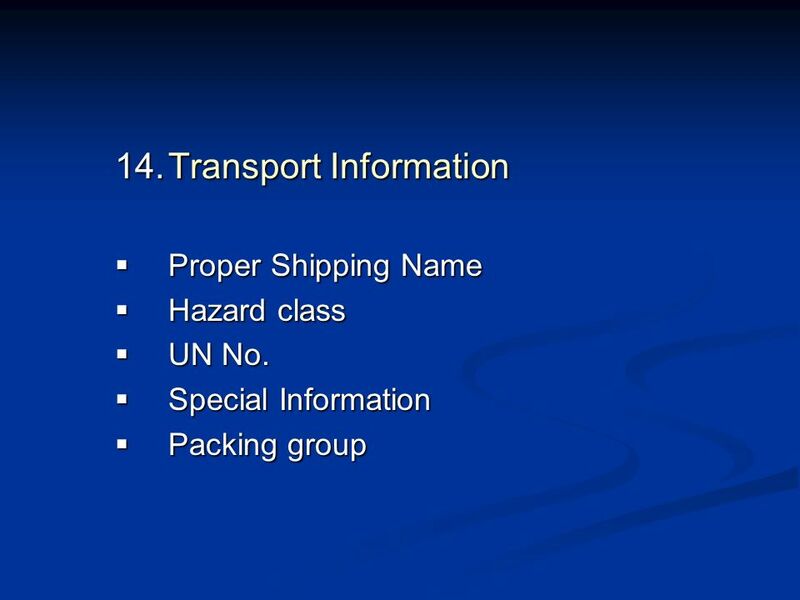 Download ppt "MATERIAL SAFETY DATA SHEET"
Safety Data Sheet and label Training Prepared by Gary Johnson October 2013. 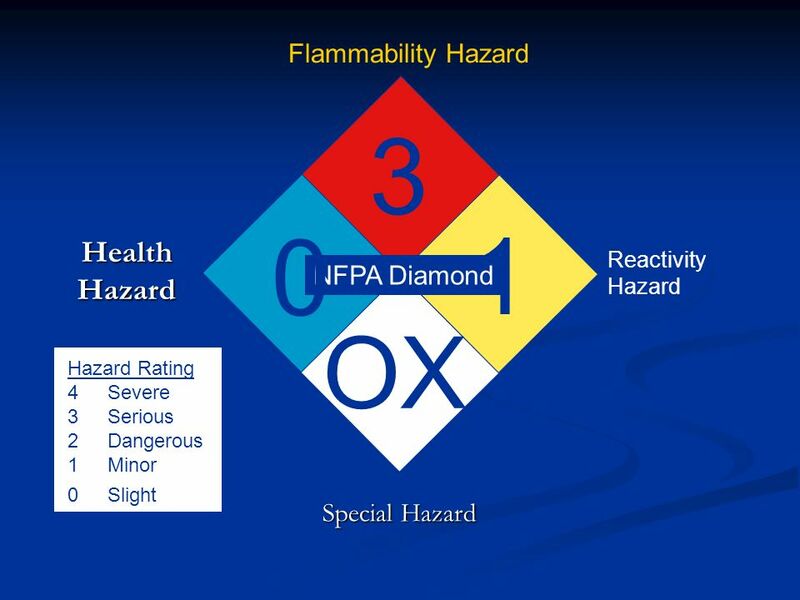 Everyone is responsible for health and safety.. WHMIS WHMIS is designed to help workers, students, teachers and employers to understand the risks posed. 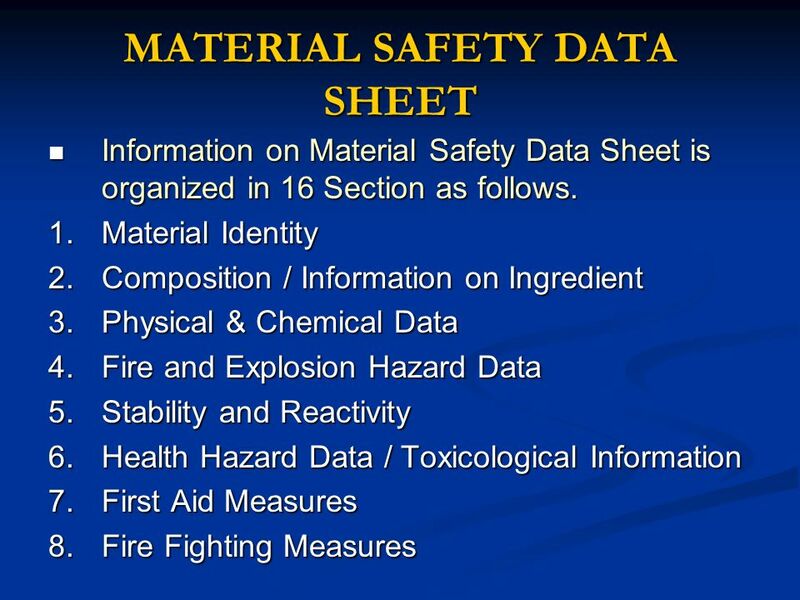 WELCOME INSTRUCTOR NAME: Dean Frakes UNDERSTANDING THE MATERIAL SAFETY DATA SHEET SAFETY BY DESIGN TRAINING REGULATORY STANDARD 29 CFR CFR.